Dimensions 1 by 8 by 9.75 in. Building electronic projects that interact with the physical world is good fun. But when the devices you've built start to talk to each other, things really get interesting. 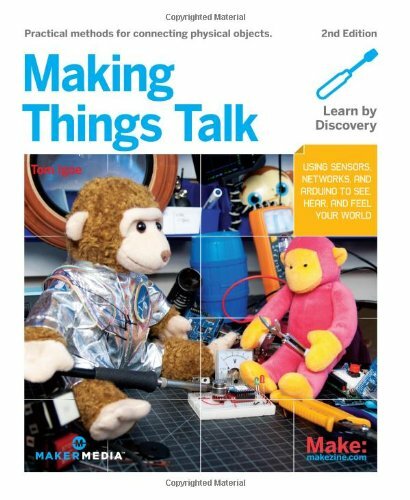 With 33 easy-to-build projects, Making Things Talk shows you how to get your gadgets to communicate with you and your environment. Itâs perfect for people with little technical training but a lot of interest. Maybe you're a science teacher who wants to show students how to monitor the weather in several locations at once. Or a sculptor looking to stage a room of choreographed mechanical sculptures. In this expanded edition, youâll learn how to form networks of smart devices that share data and respond to commands. Work with Arduino 1.0, Processing, and PHPâthree easy-to-use, open source environments. About: The workbenches of hobbyists, hackers, and makers have become overrun with microcontrollers, computers-on-a-chip that power homebrewed video games, robots, toys, and more. About: Make microcontrollers, PCs, servers, and smartphones talk to each other.